In this June 11, 2017, file photo bottles of the Coca-Cola company's Vitamin Water drinks are displayed in Boston. Could you actually ditch your smartphone for a year? 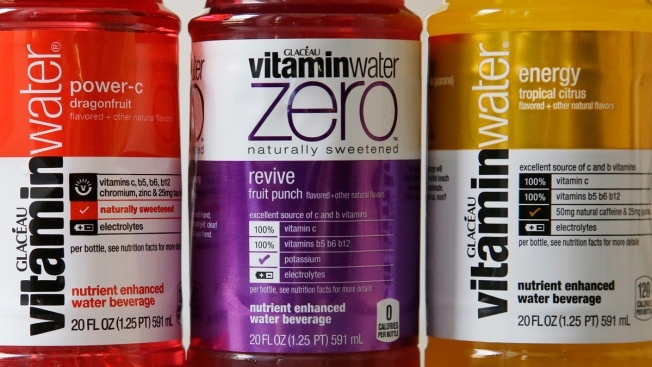 Vitaminwater wants to find out, and it's willing to part with $100,000 if someone can rise to the challenge. To enter the contest, you need to submit a post on Twitter or Instagram (so, yes, perhaps using a smartphone), including the hashtags #nophoneforayear and #contest, and outlining what you'd do if you couldn't swipe or scroll for a year. The deadline to enter is January 8, 2019. The company will select a contestant around Jan. 22, according to the contest rules, and give them a 1996-era cell phone. For the next year, if you get chosen, you can't use any smartphones or tablets at all, even those belonging to other people, but you can use laptops and desktop computers. Devices like Google Home and Amazon Echo are OK too. If you can go a full year carrying around something like what Cher used in the iconic teen comedy "Clueless, " you'll win $100,000. If you last six months, you get $10,000. Vitaminwater likes challenging monotony, Natalia Suarez, the company's associate brand manager, tells CNBC Make It. "We don't think there's anything more boring than mindlessly scrolling through your phone, and this is an opportunity to take that stance against routine and give someone $100,000 to do something uniquely awesome with their time," she says. Sadly, the deck seems stacked against millennials. Over 92 percent of them own a smartphone, according to the latest Pew Research Center data. Even overwhelming majorities of Gen-Xers and baby boomers carry one at this point (85 percent and 67 percent, respectively). Smartphones play an out-sized role in millennials' daily lives, according to Gallup polling. About eight in 10 of them use them to accomplish everyday tasks, such as managing their finances, paying bills, shopping online, and watching or listening to online content. Those between the ages of 18 and 34 spend over two and a half hours a day just consuming entertainment content on their smartphones, according to the latest 2018 Nielsen Total Audience Report. And a poll earlier this year found that 43 percent of millennials say they check their phone at least every 20 minutes. Making it even more unlikely that a millennial could win is this caveat from vitaminwater: "You cannot be required to use a smartphone for work or other commitments." Overall, 63 percent of workers use their cell phones on a daily basis for work calls, according to last year's workplace connectivity survey by Zinwave. Almost half of millennials specifically report using their cell phones now much more than a year ago. And if a millennial's chances of winning are slim, Gen-Z may have no chance at all. This generation is so hooked to its devices that a recent Atlantic article asked, "Have Smartphones Destroyed a Generation? " Jean M. Twenge, a professor of psychology at San Diego State University, found that Gen-Z used their smartphones for so much of their daily interaction that they are "on the brink of the worst mental-health crisis in decades." Anyway, the rules specify that you need to be 18 or older to enter. So it seems to be down the members of Gen-X and Baby Boomers. At least they'll know how to use a mid-90s cell phone.